Summer is a beloved time in the south. Yes, the heat can cause dogs to go crazy, turn plastic neon pools into a backyard oasis, and shatter windshields. But still, there is something beautiful about the season. One of those special entities comes in the form of a perfectly ripe, juicy peach. The floral smell mingling with honey is tantalizing and slightly addictive. 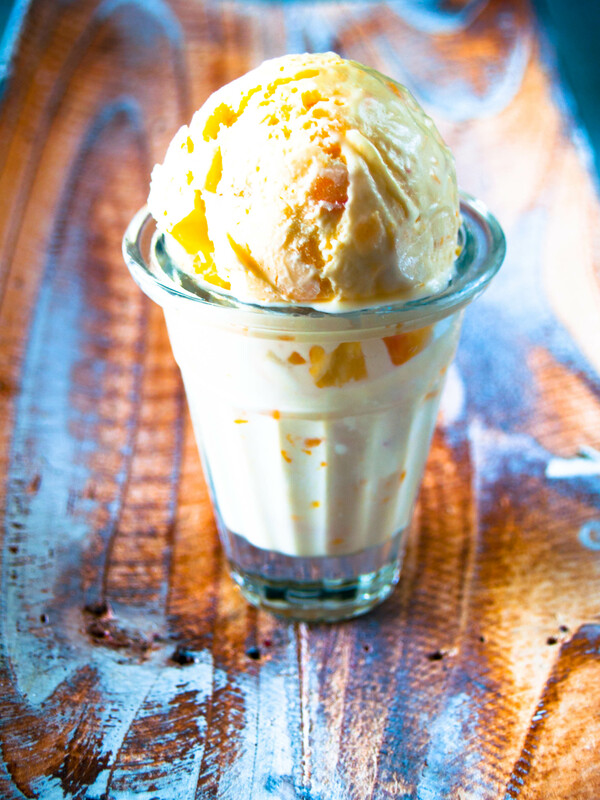 One of my summer infatuations comes in the form of a creamy ice cream with fleshy pieces of peaches poking through. There is a small produce stand right on the side of the road in Clanton, Alabama where the peach ice cream is downright mesmerizing. As you walk up to the stand, the smell of peanuts roasting fills the air, tomatoes the size of my face stare at me, but alas, it is inside, where my heart is truly fulfilled (and its where the air conditioning is, but that’s for more practical reasons). There is a case of homemade ice creams: strawberry, vanilla, chocolate. But only one can make me go weak at the knees: fresh peach. I grab my cone of peach goodness and wave it around like a scepter. The peanut eaters and the tomato pickers may be angry with me gesticulating around my torch of happiness, but I don’t care! I am content, happy and in love with my Southern summer. Pour the cream in a saucepan and add the vanilla bean to the cream. Bring mixture to a simmer over medium-high heat. Remove from heat and let steep while preparing the rest of the ingredients. In a bowl fitted with a whisk attachment, whisk the yolks and ¾ cup of sugar together until the mixture is pale and thick. Take your time on this step; it does take a few minutes. With the mixer still beating away, slowly, slowly pour the warm cream in the bowl in a steady stream. Place the bowl over a pot of simmering water and continue stirring until the mixture is thick enough to coat the back of a spoon. Remove from heat and refrigerate until chilled. Place the peaches in a bowl with the remaining 2 tablespoons of sugar. Let sit for about 5-10 minutes. Process the base in an ice cream maker according to the manufacturer’s instructions. When the cream is almost done (it will start to thicken up quite a bit), add the peaches to the mixture. Once the machine is finished with the ice cream, place into a container and freeze until ready to eat. Oh, I love Peach Ice Cream. It’s a big toss up whether Peach or Cherry is my favorite. Thanks for sharing the recipe! Honestly, I have never tried cherry ice cream! I bet I would love it. I have some experimenting to do! That would be fun! It’s made with dark sweet cherries.